"Three one-act mystic dramas concerning the life and esoteric work of Wellesley Tudor Pole. Wellesley Tudor Pole was involved in the psychic-spiritual aspect of the 'war effort' in Britain during WW2. He was also involved in the evolution of Glastonbury, being the founder of the Chalice Well Trust. Through his direct connection with Winston Churchill, the Silent Minute was instituted - one of the largest-scale intentional consciousness exercises of the last century. These plays hover between this and the other world, politics and human character, exploring a theme of world events and the role of consciousness." This drama focuses on Wellesley Tudor Pole (British, 1884-1968, founder of The Chalice Well Trust, Glastonbury). It was extensively researched for historical accuracy, with correspondences with the Chalice Well Trust. The drama is well over an hour in length and has a cast of 21. 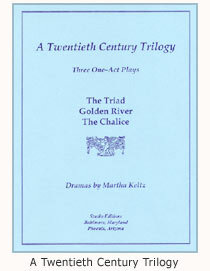 All three plays of the Trilogy can be performed on the same set: simple and abstracted and representing both the atom and the world. Very few props are required; lighting is critical. The drama opens in 1917 with an eve–of–battle conversation between two young British officers in the hills overlooking Jerusalem. The battle of the next evening is dramatized, with the miraculous rescue of Lieutenant Tudor Pole, who is spared for future spiritual work. The scenes that follow occur beyond time and place, in the spiritual world, beginning with Three Young Women and a Cup, who speak in verse (rhyme, meter); a meeting with Tudor Pole (still in earthly life) and his comrade who has passed away; the appearance of the WWI slain; a meeting with Tudor Pole and the Triad of Heralds that connects the past with the future (the splitting of the atom, WWII and the atomic bomb); and finally the re–appearance of the Three Young Women, the slain men and women, and the climactic entrance of the great Atlantean Initiate, whose work is intimately connected with both Glastonbury and the Southwest United States. The last scene of the drama takes place in an outdoor setting near London in 1940, not long after the evacuation of Dunkirk, and portrays Major Tudor Pole’s meeting with Prime Minister Winston Churchill (and Churchill’s chauffeur), during which the famous "Silent Minute," as well as mysterious causes of WWII are discussed. This drama, also carefully researched, is over an hour in length and has a cast of 19. Wellesley Tudor Pole and his Guide alight on the Los Alamos mesa, near the Sangre de Cristo Mountains in northern New Mexico. Tudor Pole learns that the Elemental of the Rio Grande — or Golden River — has been repelled from his home by radioactive pollution, and expresses a wish to restore the "Grande Elemental" to his home. The Guide next directs Tudor Pole’s consciousness to a conversation taking place between J. Robert Oppenheimer and a Young Scientist, shortly after the successful atomic bomb test at Trinity, Alamogordo. Oppenheimer reveals there is no hope the bomb will be demonstrated — one or more will be dropped on urban areas in Japan. He says no one could argue with the rationale for use of the bomb, the reasons were so totally reasonable. . . The conversation moves to the topic of moral responsibility; Oppenheimer discusses a world of endless duality which does not comprehend the neutral factor, or the Trinity; the Age of Reason; John Donne’s poetry; the comparison of postwar Russia and America to two scorpions in a bottle; and what he considers the most serious moral wrong: the fact that the American and the Japanese people are unaware of the work on the atomic bomb and the subsequent emergence of the nuclear age — it has all been kept secret. The third drama of A Twentieth Century Trilogy begins in the year 1975 and extends to just beyond the year 2000. It is similar in length to the first two dramas and also has a large cast: 22 characters. It is performed on the same set as the first two dramas. At the opening, three young travelers, a journalist, an archaeologist and an illustrator, visit Chaco Canyon and other areas of New Mexico with a goal towards collaborating on a book about sacred sites in the United States. Prompted by a meeting with a hiker (Wellesley Tudor Pole, carrying the hooked stick of the Guide) who points to the devastation of the emergence of the lower "I am" on the social harmonies of old, the gifted triad begin to experience a reawakening awareness of places of special energies, where forces of Earth and Cosmos unite, places marked by the peoples of prehistoric and ancient civilizations with sacred buildings, animal effigies, "old straight tracks," mounds and pyramids. The increased Earth consciousness is accompanied by painful knowledge of the errors of misled modern mankind and his alienation from nature. The triad resolve to work together that something new and healing — a Chalice — might emerge from their combined efforts.